← Governor Baker: can he be a compassionate fiscal manager? In Paris on Sunday more than 1.3 million people solemnly marched a cold and windy 3.2 kilometers from La Place de la Republique to La Place de la Nation The crowd moved along the symbolically significant Boulevard Voltaire, the Enlightenment philosopher known for his biting satires and defense of free speech. This largest demonstration in French history was organized to pay tribute to last week’s 17 victims of a radical Islamic sleeper cell and to stand in solidarity against fanaticism and for freedom of expression. It was a moving and remarkable sight. 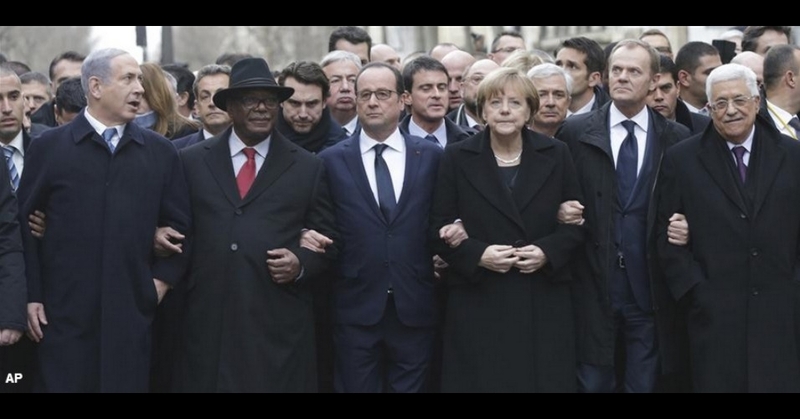 Dozens of world leaders and dignitaries, not wanting to miss a great political opportunity, flew to town and were bused to the front of the line, marching just long enough to have their pictures taken, walking arm in arm, symbolically standing together against terrorism. Hamas, Hezbollah and others who didn’t come sent their condolences. Right. Much has been made of the conspicuous absence of the US President, Vice President or other high ranking administration official at the gathering. I’d like to have been a fly on the wall for the go/no go discussions. Clearly the Administration mishandled the communications, if not the presidential visit decision. The security and distraction excuses are legitimate. (The perpetrators were well known to French authorities, and interagency communications there are not much advanced from 9/11 levels). There was less than 36 hours to plan for Obama’s safety. What would the critics of Obama’s no-show have said had he gone and been assassinated? Obama’s security demands would have been even more disruptive to the participation of ordinary folks than that of other leaders. Eric Holder who was already in the City of Light for security and anti-terrorism meetings, and stayed for Sunday morning television interviews, should have been told to hang around for a symbolic 3 PM photo op. White House spokesman Josh Earnest conceded yesterday that the White House made a mistake in not having higher level US representation. At times like this, symbolism matters. Which is why there was jockeying by some world leaders for position in the march. As The Washington Post noted, “political opportunism was in the air.” According to reports, the French had asked both Israeli Prime Minister Bibi Netanyahu and Palestinian President Mahmoud Abbas to stay away because of security concerns and because of a desire to minimize distractions and politicking. But reports that Netanyahu’s domestic political rivals would attend prompted the Israeli president, running for a fourth term, to reverse himself. And so, therefore, did Abbas. The maneuvering to be right in the middle of each camera shot has been ably captured by The Forward. At least, President Obama was spared the indignity of such political ballet. But all the kumbaya theater belied some troubling realities and rank hypocrisies. Netanyahu linked arms with the president of Mali, which doesn’t recognize Israel’s existence. Participating in the demonstration celebrating freedom of speech and unfettered press were the presidents of countries that severely limit freedom of information and expression. Arab and African marchers (Gabon, Yemen, Egypt, Turkey, Algeria, the United Arab Emirates) have large numbers of journalists locked up in their jails. Saudi Arabia sent a representative while back home it was flogging a blogger for blasphemy. Putin sent a Russian representative to stand with Charlie. Even China, bastion of limited expression, sent words of support. The marchers’ hypocrisy goes beyond their treatment of journalists. Turkey, represented by its prime minister, has allowed jihadists to travel across its borders to Syria to train. Many countries’ decisions to participate were dictated by domestic politics. Clearly, the middle in France itself was determined not to let Marine Le Pen’s right-wing, anti-immigrant Front National appropriate the imagery for its own electoral ends. Le Pen was disinvited from the Paris event. The White House is hosting an international anti-terrorism conference on February 18th. One hopes that event will produce some substantive strategies to improve intelligence gathering and thwart terrorist attacks, at which point all the fussing over lack of presence at the rally will be long forgotten. Tomorrow’s Charlie Hebdo will print more than a million copies of its weekly magazine. And journalists the world over will continue their work of getting information to the people, for them to decide when their leaders’ actions are true or hypocritical, symbolic or substantive, peace loving or dangerous. This entry was posted in Culture, Politics and tagged Attorney General Eric Holder, Bibi Netanyahu, Charlie Ebdo, February terrorism conference, Front National, Mahmoud Abbas, March in Paris, Marine Le Pen, President Obama, Press Secretary Josh Earnest, Reporters without Borders, terrorist attack in France, The Forward, Vice President Joe Biden, Voltaire, world leaders hypocrites. Bookmark the permalink. Thank you Margie for this insightful piece. You are right on. Thanks you Margie for this insightful piece. You are right on.